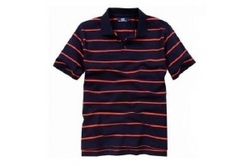 Leading Exporter of men's polo t shirts from Ludhiana. We have an extensive gamut of polo neck t-shirts which are designed in variety of prints, color combination's and patterns. These are available in different sizes and styles. We offer our range at reasonable prices. Customization is done as per the clients specific requirements.